TOP FURTIVE: HOW TO TAKE A SCREENSHOT OF AN ENTIRE WEBPAGE IN GOOGLE CHROME. HOW TO TAKE A SCREENSHOT OF AN ENTIRE WEBPAGE IN GOOGLE CHROME. Have you ever wanted to have screenshot of an entire webpage while browsing in Google Chrome? Yes, we can use print screen or snipping tool, but what if we want the full web page in just one single shot? Here’s the easy solution to capture entire webpage or selected portion of the web page or only visible part of the webpage. To capture the entire webpage all you need is to install “Awesome Screenshot” extension to your Google Chrome. 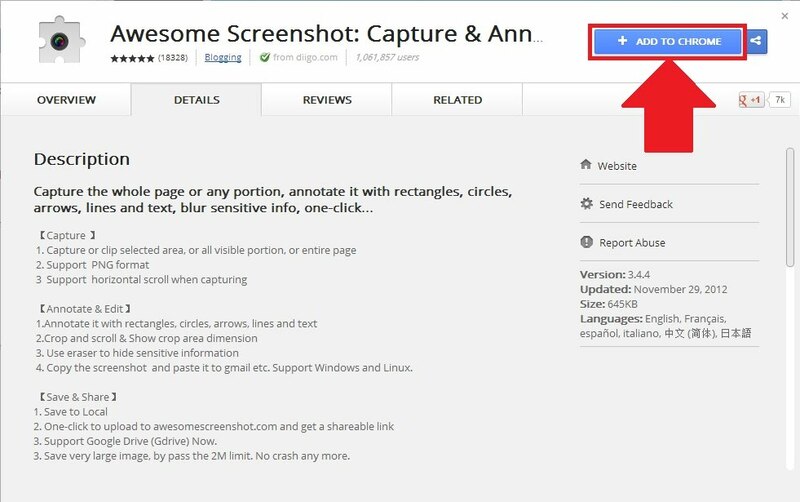 To install Awesome Screenshot to you Google Chrome, click here. After opening the page, just click on ‘Add To Chrome’. [OPTIONAL] After installation, go to ‘Customize and Control Google Chrome’ => Tools => Extensions. Here you can view all your extension installed in your Google Chrome. Find for ‘Awesome Screenshot: Capture & Annotate’ and tick ‘Allow in Incognito’. This will allow you to even take screenshots while working with Incognito Window in Google Chrome. That’s all, now you will see a new icon in your Google Chrome right next to your address bar similar as shown below. Whenever you want to have the screen shot just click on that icon and select appropriate option between entire webpage, selected web portion or visible web portion. After the screen shot, you will be forwarded to editing tools where you can blur your private data, write text, etc. After editing, click on Done. Also there are options to save on Google Drive, print the screen shot, copy to clipboard or Download/Save that to your PC or laptop. The preview of the final screen shot of entire web page is here. Here's the youtube video which features the Awesome Screenshot: Capture & Annotate for Google Chrome. That’s It. If you have any problem, feel free to comment below. Have a Nice Day Ahead. Artikel HOW TO TAKE A SCREENSHOT OF AN ENTIRE WEBPAGE IN GOOGLE CHROME. ini dipublish oleh Unknown pada hari . Semoga artikel ini dapat bermanfaat.Terimakasih atas kunjungan Anda silahkan tinggalkan komentar.sudah ada 0 komentar: di postingan HOW TO TAKE A SCREENSHOT OF AN ENTIRE WEBPAGE IN GOOGLE CHROME.